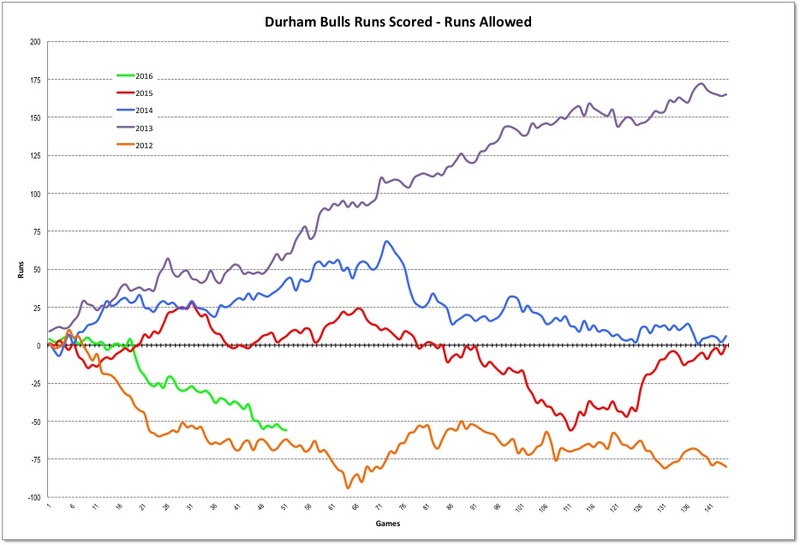 Three Bulls caught stealing (two as the result of pickoffs) is simply an awful bit of base-running performance by a team that can hardly afford to waste runners who get to base, although they were 0 for 7 for the runners who did get into scoring position. Adam Wilk pitched a decent game, giving up just two runs and ending up with a nice Game Score of 63, but without run support he picked up his 6th loss. At 11 games below .500, the Bulls are saved from ignominy only by the even worse won-loss record of the Norfolk Tides who are 16 games below .500. Standings. 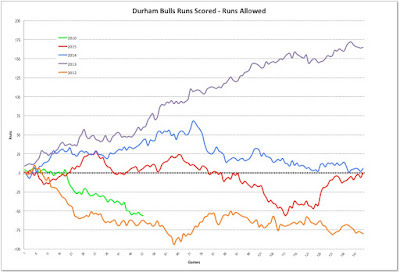 Looking at the runs the Bulls score vs the runs they allow, the Bulls are cruising toward 2012 territory, a year the Bulls finished 15 games below .500 and third place in the IL. Runs scored compared to runs allowed can also be cranked through the Pythagorean Expectation formula, but when you do that with this years' numbers (154 runs scored, 210 runs allowed) it shows that the “expectation” is even worse than the current 11 games below .500. It drops to an expectation of 18-33, 15 games below .500.